College is a drastically different experience than high school. When I think about what my life was like just a couple of years ago, I remember the obvious milestones first: big races that I won, Prom, taking the SAT, and learning to drive. That last accomplishment, getting my drivers license , was huge, because it led to so many other memorable adventures in the San Francisco Bay Area. But when I think about it, driving wasn’t only important for the occasional weekend excursion…it was an integral part of my daily life, both before and after I was the one behind the wheel. 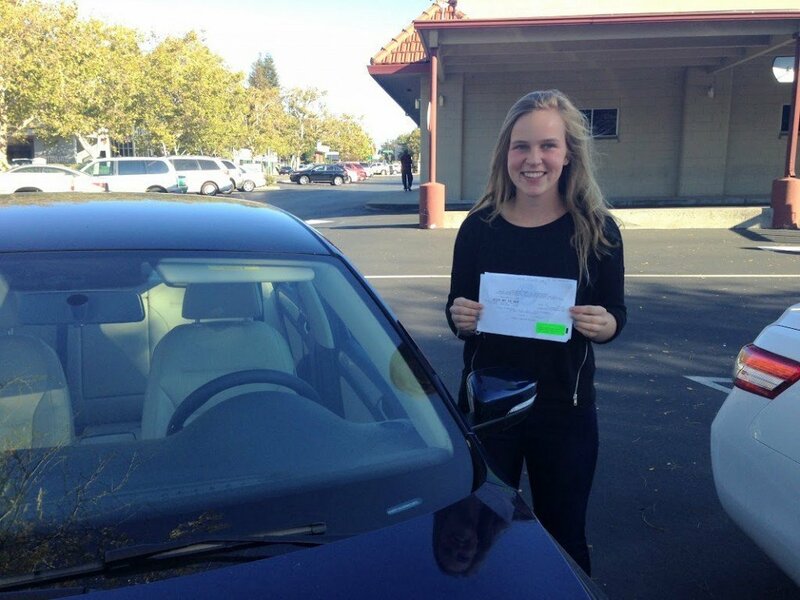 Amy as she was getting her license! I was in more carpools than I could count on both hands. Each year, I rode with different groggy-eyed kids on our foggy morning commute to school. As a freshman, I sat squished in the middle seat every day, trying to stay hip to the conversations of the senior boys in the carpool. The driver, Nate, always had cool alternative music playing, and sometimes I would try to impress him when I knew the band. Then, one morning, he completely inverted my impression of his musical taste when he played a Taylor Swift album for the entire ride. At first I thought it was a joke. No one said a word. Carpools can also make for unexpected friendships. For three years, I roughed it to rowing practice with the one teammate who attended the same high school as I did. Not the most natural of friends (we both had strong personalities), it sometimes felt as if we were siblings crammed into a family car for a long road trip. Nevertheless, through the evolution of our moms’ towing us to practice to us driving ourselves, we both grew up just a little bit during each day’s twenty-five-minute commute. Our sometimes-contrasting points of view made for reliably lively conversation. Once I could drive myself, I also learned how driving alone can serve not just as transportation, but also as a contemplative, even meditative, break from my schedule. My evening drive home became my time to let the events of the day settle into memories, and let my teenage anxieties fly out the window. Some nights, it came through fearlessly singing Taylor Swift songs (I eventually came around to her pop). Another night when I was 16, I took the scenic route to console myself right after a tragic high school breakup (after I had calmed down, because I did know not to drive while extremely emotional ). We use the word “driving” in its verb form–it’s just an action that we do to go from one place to another. We divide up our lives among our different Points, Point A and Point B and so on–spending eight hours here, five hours there. What about the time that accumulates in transitions, during these daily little segments on the road? Only in retrospect do I appreciate the time I spent driving in high school, and I think it’s okay that some moments only reveal their value in hindsight. My point here is not that you must constantly feel pressure to “stop and smell the roses” while you are driving in the car. Certainly, there is beauty to be found in the mundane and memories to be made within daily routines. But my argument is much simpler: don’t always think of your time spent in the car as wasted time getting from Point A to Point B. Think of it as another small, yet important chunk of what makes your day unique.